As always this crop season has brought unique opportunities and challenges for corn silage. It may be helpful to compare and contrast 2018 with the last two years as we look at the potential timing of this year’s harvest. For much of the state, 2016 was excessively dry to drought conditions through mid-August. However, where the crop survived to see the rains in late August it bounced back a bit, though some yield was already lost. Late summer saw some more normal rain events and a continuation of above average growing degree day (GDD) accumulation. Typically, we would expect the heat to lead to earlier maturity of the corn crop. However, with each shot of rain, the stressed crop seemed to re-hydrate as it attempted to finish ear development, which resulted in an extended dry down period and later than expected harvest. We don’t need a reminder that the 2017 season was wet and cool from beginning to end. Late planting and below average GDD accumulation delayed harvest well into the fall and some of the crop received a killing frost prior to maturity. Also of note is that GDD accumulation slows down considerably in mid-September, so as the crop neared maturity last year it did so at a much slower pace than it is likely to this year, when it will be at this stage in mid-August to early September. This season brought excessively dry and drought conditions for much of the state. However, relief from the drought came three to four weeks earlier than it did in 2016, aiding in pollination and more normal late season development of the crop. Therefore, we should not expect the extended dry down period that was observed in many areas in 2016. In terms of GDD accumulation, 2018 was above average in May, below average in June and above average in July and August (to date). While the slight deficit in June may have led to a slower start for corn planted in late May, that deficit was erased by the end of July as we continue to accumulate above average heat units. GDD accumulation for corn planted in early May is even further above average and current forecasts suggest that most areas of the state will end August with GDD accumulation (since May 1) between 125 and 150 GDD’s above average. To translate that into calendar days, based on average GDD accumulation in late August and early September, this puts use seven to 10 calendars ahead of average since May 1. 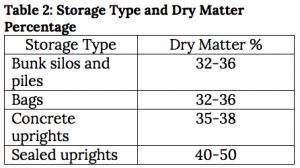 Past research by Bill Cox at the Cornell Aurora Research Farm provides approximate GDD accumulation needed from silking to the crop reaching 32 percent dry matter (DM) for 96 to 115 day relative maturity (RM) corn (Table 1). Based on this we would expect that corn below 96 day RM will take 750 GDD or slightly less. 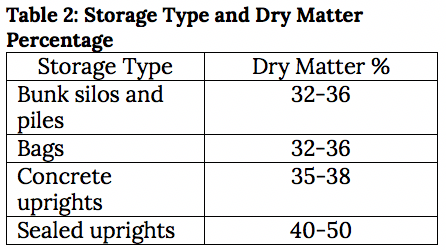 Currently 32 percent DM is considered on the low end of desired harvest DM, target DM ranges are found in Table 2. Therefore, the accumulation of 750 GDD’s after silking represents a good time to start measuring whole plant dry matters. Using our Corn Silage Hybrid Evaluation program projected crop progress is shown in Table 3a and 3b. The dry down rate of corn in the field as it nears silage harvest is largely dependent on the weather and health of the crop. A general range is 0.4 to 0.7 percentage points per day. Using 35 percent DM as a target for harvest, you could expect the crop to reach this four to seven days after it reaches 32 percent DM. Also, consider that while the crop looks like it will finish fairly strong and produce a good ear, it is not likely to recover the lost yield from early season stressors. This combined with depressed hay crop yields in many areas should be taken into consideration when projecting forage needs for the coming year. Cox, William. 2008. Timing Corn Silage Harvest. Cornell University What’s Cropping Up? Newsletter. Vol. 18, No. 4.